Welcome to my newspaper ONLINE! Welcome to Roosevelt, Oklahoma,34.8473 deg. Latitude (North), 98.9551 Longitude (West), the Greatest Place on Earth, where we're just one big happy family. And if you're not family, you're still treated like family. In fact, we'll treat you so many different ways, you're bound to like one of them! I have added a new link to the ROOSEVELT FROM A TO Z page for those that would like to visit the myfamily.com "THE ROOSEVELT OK SITE." and I will be happy to invite you to join. To create this e-zine, I just sat down and thought to myself: what do I like to read? The content comes from a variety of sources: some I've written myself, some has been written by friends, and some has been contributed by other Roosevelt friends just like you. will be held Saturday, July 21, 2001, at the Roosevelt Cafeteria. BOBBY SHEETS, Class of 1949 is the President of the Alumni Association. His address is 717 N. Broadway Hobart, OK 73651. Email inquiries may be sent to Vonda (Miller) Binghom vc@mmind.net or wjackson@sonetcom.com or jacksonxyl@yahoo.com for change of address information for mailing purposes. A country newspaper serving our friends and neighbors in Roosevelt and surrounding communities. About 100 alumni of the Consolidated 8 School turned out Saturday, July 7, to enjoy the 13th reunion held at the Roosevelt Retirement Center. Attending were Tom & Doris Avants, Noble; Ted Blish, Kennedale, TX; J. R. & Betty Bock, Odessa, TX; Noel & Ginny Brewer, Bloomsburg, PA; Jewell (Bradley) Childress, Oklahoma City; Leonard (Chig) Cleal, Yukon; Roxie (Cooper) Collins, Helena; Jack & Ruth Culvahouse, Lawrence, KS; Charles & Thelma (Barnes) Davis, Woodbridge, NJ. Grace Dempsey, Altus; Leo Dickson & Rose Thelkeld, Arvada, CO; Eldon Dickson, Albuquerque; Norris Dickson, Oklahoma City; Martin Duke & son, Big Cabin; Richard & Carol (McClure) Friesen, Enid; Gaynelle (Ellis) Gray, Lewisville, TX; Jo (Estoll) Hals, Fort Bragg, CA; Harold Haynie, Newcastle; Neil & Eva Jean (Jackson) Hayes, Liberal, KS; Ivar & Marlene (McClure) Henins, Los Alamos, NM. Ernestine (Dempsey) Morpar, Ft. Collins, CO; C. H. & Helen McClure, Olton, TX; Major McClure, Tahlequah; Rex & Wanda McClure, Edmond; Zoe (Sims) McMillin, Cordell; Jim & Lajuan (Nichols) Norvelle, Graham, TX; Fred & Virginia Polley, Arlington, TX; Ron Reese, El Reno; Wayne & Zula Reese, McAlester; Ed & Marlene (Holt) Smith & Irene Holt, Ft. Worth, TX. Faye (Risenhoover) Snow, McLoud; Keith & Sandy Sockwell, Bullhead, AZ; George & Donna Sorrell, Foster; Don Steel, Tulsa; Willie & Sylvia (Brewer) Terry, Okmulgee; Jack & Ronda Trotter, Oklahoma City; Carson & Ann Vanderslice, Marlow; Wyatt & Margaret (Vanderslice) Walker, Kingwood, TX; Rita (Smith) Walker, Shawnee; Roy & Leta (Jackson) Walkemeyer, Hugoton, KS, Mabel (Sockwell) Young, Tipton. From Hobart, Ed & Mary (Shockley) Ankney, Violet (Bright) Chapman, Joy (Shockley) Clark, Christine (Newton) Davis, Patsy (Schrader) Shockley, Virginia (Jones) Sims, Faye (Ritchie) Walker and Maggie (Barnes) Walker. From Roosevelt, Dale & Hazel (Fowler) Bynum, Tesla (Dutch) Cooper, Willie & Norine Jackson, Reba (Vanderslice) Marshall, Durwood & Margetta (Newton) Stafford, Pat & Dee Moore, and Ihsan & Luella (Winkler) Ardhuerumly. From Snyder, J. W. Denham and Jackie (Risenhoover) Jennings. From Mt. Park, Tommie Holder, Charlene (Dempsey) Mash, and Dorothy (Estoll) Shelton. From Lawton, Herman & Maxine (Holder) Ledford, Ralph & Betty Dickson, Johnnie Polley, Wilma (Duke) Stout, and Ruth Ann (Dickson) Rounds. The next reunion will be July 5, 2003. ITS A BOY! Isaac John Scott Krehbiel was welcomed into the family by his proud parents, JACOB & REBECCA KREHBIEL, sisters Nicole and Natasha, of Dickson, Tennessee on July 20, 2001. He weighed 9 pounds, 5 ounces. Grandparents are JOHN & JUDY KREHBIEL of Cooperton, and SCOTT & DORI NELSON, of Miama, FL. WE BELIEVE IT! While we're growing up, a lot of us spend a good deal of time worrying about what the world thinks of us. By the time we reach fifty, we realize the world really wasn't paying that much attention. TERRY JACKSON, DeKalb, MO, visited with his parents, Virginia & Leo Jackson, and his brothers Mike of Roosevelt, and Gregg of Hobart recently. He also attended the Roosevelt School reunion while in town. Leo is a patient at the Veterans Center, Clinton. OVERHEARD AT THE COFFEE SHOP: If it gets any dryer, the fence posts will be paying the dogs to wet on them. DURWOOD & MARGETTA STAFFORD visited her sister, OLEAN GLASGOW in Elk City on Wednesday last week. She has been ill. Visiting LaVerne Ford last weekend and attending the Roosevelt Reunion were: Loy Phlier, Denver, CO; Peggy Luck, Kanab, UT; Cindy Blackburn, Duncan; Candy Blackburn and daughter, Louisiana, Arden & Sharon Beavers, Huntington Beach, CA; Odell & Norma Beavers, Watonga, Bennie Langford, Duncan; Melissa Blackburn and Marjorie & DeWitt Hawkins, Durham. BOBBY DALE SMITH, of Albuquerque, NM, came to the Roosevelt Reunion. He said he saw many friends he hadnt seen since he graduated in 1967, but not one member of his class. He visited his parents, Perry & Louise Smith on Sunday. JUSTIN & PHYLLIS KREHBIEL celebrated their 11th wedding anniversary on Friday. Justin had returned on Thursday from a ten day business trip for Boeing at Tulsa. While in Tulsa, he visited his sister, Johnna Krehbiel Carew and girls in Sapulpa. LAVERNE FORD went to Oklahoma City Wednesday to spend the night. She left from Will Rogers Airport Thursday morning at 7 a.m. to fly to Seattle, WA. Shell be 83 on July 28th, and she goes to Seattle each year to her daughter Mary Anns for a celebration with relatives there. Roosevelt HS Alumni Committee is pleased to announce THE GRADUATE DIRECTORY, ROOSEVELT HIGH SCHOOL, ROOSEVELT, OKLAHOMA 1903-1993, 2001 Edition is available. It is 5" X 8" paperback (Perma-Bound) with bright white glossy card stock with red lettering and the Roughrider in red ink and consists of approximately 100 glossy pages of pictures of buildings, class panels, elementary school classes, etc., History of Roosevelt Schools, and a listing by graduating class of Roosevelt High School graduates (as many as were available at print time). THINK ABOUT IT: Knowledge is one thing that does not become secondhand when it is used. I, too, would like to thank everyone for their efforts in making the reunion even better than ever. When you live so far away, it is sooo wonderful to see friends and family again. The time is always too short. I missed the dance, which sounded like soo much fun, but I wanted to spend more time with my relatives. In my travels I have found there is nothing like growing up in a small town where friendships last forever. The bash at Luella and Ihsans was fantastic as always. Luncheon with classmates at Lenas was so much fun, spending 2 hours of remember when????? And Betty Broadus has been wonderful in picking me up at the airport in Oklahoma City and bringing me with her to Roosevelt. Well, just minutes after the end of the Roughrider Dance-Mixer, I would say the whole 2001 edition of RHS Alumni Reunion was a huge success. Alumni were on hand before the coffee was made and before the sign-in sheets were on the registration table. Approximately 265 signed in with their respective class/group. Approximately 167 were served the evening meal - we will have a better count come morning. Approximately 200 attended the dance, and some said about 400 people were in attendance throughout the day. Ruby Fern Johnson and Johnnie Sears had their birthday celebration (surprise) with cake and balloons, yet. The business meeting resulted in a vote for the next reunion to be held on the first Saturday in October, 2003. Bobby Sheets (Class of 1949) was re-elected President of the Alumni Association. A request was made to send change of addresses to jacksonxyl@yahoo.com for the mailing list for 2003. Only one more week until the ROOSEVELT HIGH SCHOOL ALUMNI REUNION to be held on July 21, 2001. Bobby Sheets is the Alumni President for this event; hoping to make it a spectacular reunion. If you havent sent your reservation for the evening meal, please do so immediately so we can turn in a count of those attending. For more information, contact Bobby or email Vonda (Miller) Binghom at vc@mmind.net or Carol Cooper at cfsok@mmind.net or you can email me at jacksonxyl@yahoo.com so we can be sure everyone gets all the information they need for the 2001 Reunion. Roosevelt HS Alumni Committee is pleased to announce THE GRADUATE DIRECTORY, ROOSEVELT HIGH SCHOOL, ROOSEVELT, OKLAHOMA 1903-1993, 2001 Edition is off the press and available immediately and for the RHS Alumni Reunion next weekend, July 21, 2001. Perry and Louise Smith had visitors from Ohio recently. Their daughter, Bonnie Pickett, their grandson, Perry Pickett and his wife, Christina, and their children Angel, Crystal, and Perry Jr. came for a visit. Bonnie and Angel were on their way to Mexico for a missions trip. Also visiting were Ronnie Simpson (Christina's brother), his wife and daughter, Haley from Lawton. Perry and his family also enjoyed a visit with his aunt, Merron McCormack and her husband and son at Ardmore before returning to his grandparents home. On Saturday, July 7th the family was joined by Perry's niece, Sherry & Glen Gillock and son Tyler from Glasgow, Kentucky. They stayed for the weekend, enjoying a trip to the wildlife refuge and the Holy City on Sunday. Bonnie, Perry and his family left on Monday returning to Ohio. THINGS MY DADDY USED TO SAY: "I know of starving children who would love to have this food." Class of 1951 will gather at Lena Rutledge Harris home for lunch on Saturday, Reunion Day. Class of 1980 will meet in the Jeff Vanderpol home sometime during the afternoon of the Reunion. Graveside rites were held July 14, 2001, for Carl Austin Smelser, 70, of Oklahoma City. Demuth Funeral Home is in charge of arrangements. Louella (Winkler) Ardhuerumly, of Roosevelt, performed the service. He died July 8, 2001 in Oklahoma City. Smelser was born February 14, 1931 to Carl and Eloise Smelser in Altus. He attended and graduated from Roosevelt High School in 1949. He graduated from the University of Oklahoma in 1954. He served in the U. S. Army and retired from the reserves as a Captain. He was named 32nd Degree Mason in 1954. He came from a pioneer banking family from southwest Oklahoma and spent his life in the banking business. He is survived by his children, David and Andrea Smelser of Oklahoma City and Scott and Kelly Smelser of Edmond; and grandchildren Kyle, Kristin and Lindsay of Edmond. In lieu of flowers, please make donations to Alzheimers Assn., 1 N. Hudson, Ste. 550, Oklahoma City, OK 73102. Movie "Gone With the Wind"
Book "The Other Side of the Mountain"
Penny grew up around Roosevelt, and has 3 brothers. Her future plans are to go to college. Jeff Vanderpol, son of Mr. and Mrs. Johnney Vanderpol has been selected "Student of the Week." He was born October 15 and is a Libra that enjoys water skiing and mountain climbing. His plans for the future are to engage in farming. He has one sister, Joell, who is in the fifth grade. In the first game of the District Tournament, Roosevelt won over Indiahoma 74-44. Johnny Starcher had an outstanding night scoring 34 points, including 10 for 10 from the free-throw line. The Roughriders met Blair in the finals of the District. Once again the Roughriders showed their desire to win by blasting Blair. Roosevelt Roughriders won a big victory over Arnett-Hollis in the Regional opener at Navajo. The Roughriders trailed by 11 points at one time in the second quarter. Wayne Johnson and Kent Miller both fouled out in the third quarter. Max Buchanan, Adrian Alonzo, and Robby Horn came off the bench and did an outstanding job. Adrian scored eight crucial points. Robby Horn did an outstanding job on the backboards. Max took care of the ball handling and he hit two key free-shots. Johnny Starcher and Curtis ONeal led all scorers with 14 each. All of the players are to be congratulated on a fine performance. We are proud of you. CHATTER: YEA RIDERS!!!!!!!! BEAT BUTLER!!!!!! !THANKS FOR THE PIZZA!!!!!!!!! Mrs. Garvin, what are chopsticks???? ?50 was a very bad number..Too bad, Bret. Better luck next time. Congratulations, Basil, Vonda, Mary, Debbie, Medina, and Jerry for fourth runner-up..
Curtis wasnt acting; he acts like that all time!!!!!! !Debbie R., how was the candy? Who does that man think he is anyway?????? ?Hi, Pete!!! Tamraand Debbie, hows your voice??? Basil, Hows your leg? Boys, were really proud of you!!!!!!!! Mr. Nightingale, how was that sucker?????? We paid our dollar, too!!! Basil, was he really asleep????? Youre so unfortunate!!!!!!!!!!!!!!!! OVERHEARD IN THE COFFEE SHOP: "Why should I add to my troubles by facing reality?" WE BELIEVE IT! The truth will set you free, but first, it will make you miserable! Be sure to visit Amandas snow-cone stand, AMANDAs HEAVENLY FLURRIES, on the west side of Main Street. HOP & SACK #14 Convenience Store in Roosevelt is accepting applications for part-time and full-time workers. The store is located at the intersection of Highways 19 and 183 at the north end of Roosevelt. The What is an invitation to a yard party. The When is Friday night (7 pm to midnight) on July 20th, 2001. The Where is The Ardhuerumlys (Ihsan and Luella Winkler) at 212 S. Wichita. The Why is Our Roosevelt School Reunion. Mark your calendar and plan to come with memories to share and stories to tell. You are welcome to bring finger foods to pass -if you want to. However, this is optional. Your are encouraged to bring your loved ones and to share the word with anyone I may have missed. We are looking forward to seeing you. Dont disappoint us! Arrangements have been made for the Roosevelt High School Classes of 1940 and 1941 to gather for their pre-reunion luncheon. PLACE: Roy's BBQ across the highway from the Hobart cemetery. The private dining room has been reserved for visitation and Dutch treat luncheon. Reservations are not required, but notifying me would be appreciated so I can relay the count to Roy. DONT FORGET THE FREE DANCE & ENTERTAINMENT BY ROY RODRIQUEZ at the Tennis Courts at 8:30 on July 21st. Bring your lawn chairs and enjoy the fun. Visiting in the home of Mrs. Eva Sparks on Saturday were: Marilyn Smelser Orr, Scott Smelser & family, Edmond, OK, and David Smelser & family, Oklahoma City, OK.
SHERI POUND WANN, will have back surgery on Wednesday, July 18th. More details as they are available. Only two more weeks until the ROOSEVELT HIGH SCHOOL ALUMNI REUNION to be held on July 21, 2001. Bobby Sheets is the Alumni President for this event; plans are already under way to make it a spectacular reunion. If you havent sent your reservation for the evening meal, please do so this week so we can have a count of those attending. For more information, contact Bobby or email Vonda (Miller) Binghom at vc@mmind.net or Carol Cooper at cfsok@mmind.net or me at jacksonxyl@yahoo.com so we can be sure everyone gets all the information they need for the 2001 Reunion. NOTE: DON'T FORGET TO WISH RUBY FERN JOHNSON HAPPY BIRTHDAY ON JULY 21ST. SHE WILL BE 83 YEARS YOUNG! JOHNNIE and DOUG SEARS had company on Friday. Their nephew, JOHN RAY SEARS, from Cordell, visited and had lunch with them. Then, in the afternoon, YVETTE NASH DAVIS from Bethany, OK, came and spent several hours visiting with the Sears family. Their families were old time friends. Yvette will be back to Roosevelt for the Alumni Reunion. CHARLES MAY injured his back while trying to pick up a gate last week. He has been hospitalized at Elkview General, in Hobart. He is in considerable pain. The doctors are running tests. FREE PUPPIES: Cute, adorable puppies, part Great Pyreneese and part ?????? Call Delinda Gibbons 639-2685. THINK ABOUT IT! In the battle for existence, talent is the punch, and tact is the clever footwork. THINGS MY DADDY USED TO SAY: "Things will look better in the morning." FREE PUPPIES: Need to find a home for these puppies. Call 580-639-2066. Judy (Starcher) Tripp (Class of 1968) sends word that she will attend the RHS Alumni Reunion on July 21. Hopes to see everyone. Criselda (Maldonado) Garner, (RHS Class of 1986) writes with regret she will not be able to attend the reunion this July 21, but to say Hi to everyone. She plans to stay with Mrs. Virginia Sims at the farm sometime this summer. Cris is working with Home Health in Kansas City, Kansas, so she stays busy, along with 3 children. She lived with Mose and Virginia Sims while she was in high school at Roosevelt. OVERHEARD AT THE COFFEE SHOP: Remember the time we were camping at Tom Steed, and Joe Rutledge & Brad Davis went to the bathroom. Brad decided he would play a little joke on Joe, so he took some toilet paper all rolled up and lit it, and tossed it under the stall, laughing to himself at old Joe with his shorts down and wearing those flip-flops. All he could hear was "clop, clop, clop," and all he could see under the stall was flip-flops stamping out the fire. He laughed to himself and ran out of the toilet. When he got to the pickup, there sat Joe! Brad looked back to see some big tall guy coming out of the toilet and took off. Dont you know that guy wondered about our southern hospitality? WE BELIEVE IT: Cooperation is doing with a smile what you have to do anyway. 12. Play That Funky Music Greg C.
17. High Rider Terry & Ricky M.
ADNIE LAW is a patient at Elk City Medical Center for evaluation of medication. Jim and Alice Law took her there on Monday, June 25th. CURTIS LAW ate lunch at the Senior Citizens Center on Tuesday and visited with friends and acquaintances. It was so good to see him laughing. HELP WANTED: Hop & Sack #14 Convenience Store in Roosevelt is taking applications and hiring for part-time and full-time employment. You can pick up an application at the store at the corner of Hiway 9 and Hiway 183. Phone 580-639-2656. Funeral for JOSHUA ALONZO, 23, Roosevelt, was held on Tuesday, July 3, 2001 at 2:00 p.m., at First Baptist Church, Roosevelt. Doug Henson and Randy Allen officiated. Josh passed away June 29th in an Oklahoma City hospital from complications caused by burns from an explosion at his home. He is the son of Servey Alonzo, Jr., and Holly Alonzo. He has a brother, Jeremy, and a sister, Jenny, who live at Yukon. MIKE MAY & CAROLYN MAY are coming to the Alumni Reunion on July 21. Mike is a member of the Class of 1965. Mike is the son of the late LEROY MAY and GAYLE MAY, Snyder. Welcome home, Mike & Carolyn. MAKE YOUR PLANS NOW to attend the ROOSEVELT HIGH SCHOOL ALUMNI REUNION to be held on July 21, 2001. Bobby Sheets is the Alumni President for this event; plans are already under way to make it a spectacular reunion. If you have changed addresses since the 1999 Alumni reunion, or if you know of anyone who has a new address, please send it to Bobby or email Vonda (Miller) Binghom at vc@mmind.net or me at jacksonxyl@yahoo.com so we can be sure everyone gets an invitation to the 2001 Reunion. NOTICE: The Senior Citizens Center will continue to serve meals during the month of JUNE this year. The Center is located at 401 Main St. For carry-outs, call 639-2673. J. R. Howard is Center Director. Jack & Theresa Whitson of Frederick, Oklahoma, will celebrate their 39th wedding anniversary on June 30th. The First Baptist Church, Roosevelt, will hold its annual Vacation Bible School starting June 25 and ending June 28. Classes are set for 6:30 to 9:00 p.m. each night. A program will be presented at 6:00 p.m. on July 1. For more information or a ride, call 639-2291 or 639-2439. FOR SALE: 1979 21 ft Nomad Travel Trailer - Trailer has been renovated on the inside - sleeps 4 - For more information, call 639-2367 and leave a message. WE BELIEVE IT! You grow up the day you have your first real laugh---at yourself. Clara Lenora Halford, 91, died Sunday at her home in Corn. Services were held at 10 a.m. Wednesday at the First Baptist Church in Mangum, with the Rev. Jimmy Pitson and Buddy Tinney officiating. Burial was at the Jester Cemetery under the arrangement of Greer Funeral Home. She was born in Choctaw County May 27, 1910 to Em and Genie (Whitworth) She married Wesley "Bud" Halford in Jester on Oct. 29, 1927. The lived and farmed at Jester. The were active members of the Mangum Mounties, participating in play days, rodeos and parades. Her husband died on May 27, 1988. She then moved to Corn to be near her daughter, Edna Pitts and Billy G. Pitts. She enjoyed horses, fishing, reading and having coffee with her friends . She was a member of the Baptist Church. She was preceded in death by her parents, husband, a son, James Wesley Halford; a sister, Anne Booker and two brothers. Edward Evans and Dewey Evans. Survivors include her children, Edna Gale Pitts and husband, Bill of Corn, Ila Rae Eagan and her husband Orland of Lone Grove and Weldon Halford and wife, Bennie of Snyder, Texas; a sister, Ina Faye Morris of Tehachapli, CA, grandchildren, Larry Halford, Debra Halford, Rocky Halford, Wesley Halford, John Halford, James Halford, Jr., Dennis Halford, Linda Scrimshire, Beverly Eagan, Ronnie Halford, Sharon Fritz, Patricia Dennis, LaDonna Halford, Brett Pitts, Brent Pitts and many great-grandchildren. Patricia Ann Scott, 58, Roosevelt, died June 9, 2001, at her home after an extended illness. She was born December 6, 1942, at Hobart to Robert Kelly and Dollie Mae (Harris) Mitchell. She graduated from Hobart High School in 1960 and married Curtis Scott December 27, 1960 in Lawton. She moved to Grand Prairie, TX, in 1962, to Lawton in 1974 and to Roosevelt in 1987. Mrs. Scott was a member of the Baptist Church. Survivors include her husband, Curtis Scott, of the home; two daughters, Carrie Garza, Hobart, and Kimberly Garza, Roosevelt, 15 grandchildren, two great-grandchildren, one sister LaDonna Frye, Hobart; and one brother Kelly Mitchell, Desota, TX. She is preceded in death by her parents and a daughter Angelia Mae Scott in 1986. Services were June 12, 2001, at Hackney Gish Chapel in Hobart with Rev. Ronny White officiating. Burial was in Sunset Memorial Gardens in Lawton. Jack Roberts, 77, Hobart, died June 11, 2001, at Elkview Genral Hospital in Hobart. He was born August 16, 1923, in Gadsten, Alabama, to J. N. and Ollie (McCleskey) Roberts. He graduated from Roosevelt High School and was a Veteran of the U. S. Army during World War II. He married Hazel Block July 16, 1950, at Cooperton. Roberts farmed in the area for many years and was a member of the Baptist Church, VFW and the Masonic Lodge. Survivors include his wife Hazel of the home; two daughters and husbands, Kristy and Tom Smith, Hobart; and Jackie and Jon Barton, Kingwood, TX; four grandchildren, one great-grandchild; and five sisters: Mildred Dennison, Owasso; Francis Herod, Owasso; Jenny Hill, Apache; Shirley Thompson, Weatherford, TX; and Kate Stafford, Houston, TX. He is preceded in death by his parents and one brother, Bill Roberts. Services were June 13, 2001, at First Baptist Church of Hobart with Rev. Alvin Funkhouser and Rev. Tommy Clark officiating. Burial was in Hobart Rose Cemetery under direction of Hackney-Gish Funeral Home in Hobart. Has anyone contacted you yet for an opportunity to help sponsor the Free Entertainment and Dance on Saturday Night, after the Roosevelt High School Reunion? Full page ads are $25.00; half page ads are $15.00, and quarter-page ads cost $10.00. Contact WANDA SIMMONS or WANDA JACKSON if you wish to help welcome the Roosevelt Alumni home for the reunion. CON. 8 REUNION SET FOR JULY 7TH. Everyone who ever attended Consolidated 8 School is invited to attend the school reunion from 3-10 p.m. July 7 at the Roosevelt Senior Citizen's Center. A memorial will be held at the school site at 4 p.m.
Reservations for dinner need to be made by June 1. For more information, contact Ruth Ann Rounds at 24 NW 27th, Lawton, OK 73505, phone number 580-355-1894 after 6 p.m. THINK ABOUT IT! The only difference between a rut and a grave is the depth! NOTICE: The Roosevelt Senior Citizens Center will continue to serve meals during the MONTH OF JUNE THIS YEAR. RAY and MARTHA HACKNEY have returned from Houston, TX, where they have been busy closing the acquisition business for Hackney-Gish Funeral Home, Hobart, Pitcher-Hackney Funeral Home, Carnegie, OK, and Hackney Funeral Home, Mtn. View, OK.
West Oklahoma Funeral Services, Inc. has been formed, Ray Hackney, President, and has purchased the above funeral homes from Service Corporation International, the world's largest funeral service company. The opportunity came about very sudden, and the Hackneys felt that the operation would better service the communities involved if they had local ownership and management again. As for the former Roosevelt Baptist Church property, the opportunity to make that purchase came at the same time and needed immediate attention. They have purchased the buildings from the First Baptist Church. ; however, no definite plans have been made for the buildings and their use, but they probably will be incorporated with the other facilities for use in the business. Sharon (Block) Martins update on her girls should have included JAMI, her oldest daughter. She is one of the top hairdressers at Regis Hair Stylist in Sikes Center Mall, Wichita Falls, TX. Jami has a 2-year-old daughter, SYDNEY. Sharon graduated Roosevelt High School in 1980. NAOMI AILENE (HAYSLIP) RODEN, 81, passed away May 31, 2001, in Grady County Memorial Hospital, Chickasha, OK, following an illness of several months. She was born August 31, 1919, in Commerce, Texas, to Daniel and Irene (Jackson) Hayslip. She grew up in Roosevelt and graduated from Roosevelt High School in 1938. She went to cosmetology school in Hobart and worked as a hairdresser for several years. She married Leon Roden on July 6, 1944, in Elk City and lived in San Francisco, Hobart, and Oklahoma City before coming to Anadarko in February 1948. They both worked for the Anadarko Daily News, he for 32 years and she for more than 20 years. She retired in 1996 after Leons death. Mrs. Roden was a member of Virginia Avenue Baptist Church and received a plaque of recognition for teaching a Sunday School class for 15 years. She had been a resident of Christian Care Retirement Center in Chickasha since September. Survivors include one daughter, Marilyn Lyon and her husband, Ross, Anadarko; one son, Kenneth L. Roden and his friend, Nancy Daniel, of Oklahoma City; two grandsons, one granddaughter, six great-grandchildren and three half-brothers, Jerry Hayslip, Oklahoma City; Gaylon Hayslip of Roosevelt; and Dan Hayslip of DeSoto, TX. She is preceded in death by her parents, her husband, one sister, Lorene Hayslip Smith. Services were at 2:00 p.m. June 4, 2001, in the Virginia Avenue Baptist Church, Anadarko, OK, with Rev. Keith Morgan, Pastor conducting the services. Interment was in Memory Lane Cemetery, Anadarko, OK, under the direction of Steverson Funeral Home. Casket bearers were Chad Roden, Marty Bryant, Ron Lyon, Ross Lyon, Kenny Weaver, and Bill Hall. WE BELIEVE IT! Praise, like gold and diamonds, owes its value to its scarcity. JIMMIE MARTIN had minor surgery on Wednesday at Jackson County Memorial Hospital, Altus, OK.
JOSH ALONZO, son of Servey Alonzo, suffered serious burns over his body on Thursday at his home in Roosevelt. He is a patient in the Baptist Burn Center, Oklahoma City. JENNIFER MOORE, ELIZABETH (BOYDSTON) MILLER, and GLENDA (SPARKS) FUNKHOUSER spent 3 days in Eureka Springs, Arkansas celebrating Glenda's 50th birthday over the weekend of May 18-19-20. Glenda's birthday was May 20. They had fun sight-seeing, shopping, eating and just having fun. Many pictures were taken. Upon returning to Oklahoma, they got in terrible thunderstorms. Little did they know that tornadoes were sighted where they had just come from. But they made it back safely. Elizabeth lives in Tulsa, Jennifer lives in Norman and Glenda lives in Fletcher. THINK ABOUT IT! Wise men are not always silent, but know when to be. Mark this on your calendar we are glad to have this opportunity to meet, eat good food, and enjoy each others company. ROGER BEAVERS, Norman, was passing through town on Memorial Day on his way to visit with his mother, Victory Beavers, in Altus. Mrs. Beavers taught Business Education at Roosevelt High School from approximately 1959 until 1970. The VIOLA POLLARD FAMILY gathered in Roosevelt for the Memorial Day Weekend to visit at the home of their mother, the late Viola Pollard. It was good to hear the laughing and singing come from that yard; welcome home! RUBY RAE CLARK, 86, lifelong resident of Roosevelt, died Tuesday, May 29th, in a Duncan hospital. She was born April 14, 1915 in Mountain View, Arkansas. She married E. R. Clark in 1932. He died in 1984. Survivors include 4 sons: Lex Clark, Duncan, OK, Troy Clark, Marlow, OK, Joe Clark; Sayre, OK; and Steve Clark, Pryor. Also 8 daughters: Avis Schenk, Nebraska, Peggy Newman, Texas, Paula Kendall, Fletcher, OK, Alice McCall, Roosevelt, OK, Georgette Denton, Granite, OK, Liz Lowell, Roosevelt, OK, Lee Ann Claxton, Roosevelt, OK, and Rebecca Smith, Duncan, OK; 27 grandchildren, 30 great-grandchildren; and 2 sisters. Graveside services will be held at 2:00 p.m., Saturday, June 2, 2001, at the Roosevelt Cemetery with Joe Clark officiating. Interment under the direction of Hackney-Gish Funeral Home, Hobart, OK.
JIMMIE and CAROLYN MARTIN had visitors for the Memorial Day Weekend. Jimmies sister, Julia, San Antonio, and a friend came on Friday and went home on Saturday. Also visiting was Penny (Martin) McCuiston and Lindsey, Indiahoma. Just wanted to let you know how much I enjoy hearing news from home. I know you don't hear from me much, but keep sending the news. It might be a little late, but I would like to thank everyone who attended Grandma Block's 90th birthday party. It meant a lot to me to see such a turn out. well. Thanks again!! Sharon (Block) Martin. BUD JOHNSON, Cooperton, took a fall on Thursday hear his home and suffered a broken right shoulder. After being treated in an Oklahoma City hospital, he has returned to his daughters (Gina) home in Chickasha. He came by Roosevelt today on the way there. Get well quickly, Bud. LELAND WHITE, Colorado Springs, CO visited with family and friends at Cooperton during the Memorial Day weekend. He visited the J. C. White Home Place at Cooperton. Also, he spent some time with James and Dorothy Jewell Raasch and Allen and Betty Moore. He spent the night with his cousin, WANDA SIMMONS, Roosevelt. They are cousins. Leland has retired recently and says he plans to take it easy restoring old cars and skiing in the winter. He returned home on Tuesday. MANUELA ALONZO, has returned home from a visit with her son, ANDY ALONZO, and family. They live in Corpus Christi, Texas. Artice C. ()Nunn) Burns; she expired on April 16, 2001. Also, I have another sister, Anita M. (Nunn) Simmons, and a friend, Marguerite (Hartzog) Tiner, that were graduates. Mrs. Tiner did not receive notice of the reunion; however, I did contact her and sent her a copy of the announcements. Some of the Alumni might be interested in knowing about Artice; plus the fact that Anita has been bedfast for some time now (she also has dementia and doesn't know any of the family). As for Marguerite Tiner, I offered to go get her and bring her to the reunion if she wants to come since she no longer drives. Her address is: 1819 S. Meredith, Dumas, TX 79029. Am waiting to hear from her. In the event I do not bring Mrs. Tiner, my regards to all and may you have a successful and rewarding time together. P. S. I attended school there first through fourth grade, leaving in 1935, but still remember a lot of friends and classmates from those years, ie: Arla Jean Howard, Betty J. Jones, Audry and Paul Lee Walker, Anna L. Mock, Howard Moore, Vernon, Jones, Lucille Ford, Viola Sheets (know some of them have already passed away. We had a wonderful reunion for the TERRY FAMILY on Sunday, May 20th here in Tecumseh, Oklahoma at the city hall. I will be calling Roosevelt before too long to see if we can find a place to have next years reunion closer to the "Ole stomping grounds" !! HA, HA. We had a few visitors from Windsor, California. Betty Terry and son Calvin (wife of Kenneth Terry) were present along with Debbie and David Hard (Debbie is the daughter of the late P.M. Terry). C.D.Terry, the eldest of the Cliff Terry family, was there. His family farm was (I believe) two miles west of town. C.D. (my Dad) is the manager of the Tecumseh Ribbarn; sister Loneta F. Terry Elkouri and her 3 children and four of her grandkids were there. Neta is in real estate in Altus, OK. Brother Paul Wesley Terry is now the parts manager of McClain's R.V. store in OKC. Baby brother Don Dale and wife were there. He owns and operates Ribs-N-More in Moore at the Tri City Shopping Center. Sheerian Terry Wonderlin (daughter of Edgar Issac Terry was there. Also present were Vencil Lawerence and daughter Luella Kranz. Vencil was married to Loretta Terry . She passed several years ago. In fact, Vencil is remarrying some time this week. Ed Terrys' son James E. Terry and wife Susan were there. We all had a wonderful time. And, ofcourse, stories of Roosevelt, Cold Springs, Frog Pond School, Con. Eight and many more were told over and over again. I had a paper with the information of your reunion posted so hopefully some will be there. I have spent the last three years researching the Terry and Hamilton families. All of them attended that school at one time or another. We plan to all be there next year and take a picture in front of the school. Thanks for your interest in the Terry Brood, and please direct anyone with stories or pictures of any of them to my e-mail, ribbarn@prodigy.net . BETTY MOORE had visitors for Memorial Day. They were: JUDY TRIPP, SHANE & RHONDA & TABITHA TALLEY, Yukon; JANET & RANDY SHIRLEY, Duncan; JERI & MERT BUCHANAN, Johnna, Hannah, & Mariah, Sentinel. J. R. and JOANNE HOWARD, went to Geary, OK for their 49th High School Class Reunion. They returned home on Monday. MAKE YOUR PLANS NOW to attend the ROOSEVELT HIGH SCHOOL ALUMNI REUNION to be held on July 21, 2001. Bobby Sheets is the Alumni President for this event; plans are already under way to make it a spectacular reunion. If you have changed addresses since the 1999 Alumni reunion, or if you know of anyone who has a new address, please send it to Bobby or email Vonda (Miller) Binghom at vc@mmind.net or me at wjackson@sonetcom.com so we can be sure everyone gets an invitation to the 2001 Reunion. May 22 Brad and Mallory Davis 25 years! A bad thunderstorm, if not a tornado, left LAHOMA WALLACE without a roof on her trailer on Thursday night. Winds were reported at 70 mph at Hobart and Altus. Numerous trees were damaged around town. Small sheds and a barn west of Roosevelt were destroyed. Around 2 inches of rain was received. Then on Saturday night the area received another 2 to 3 inches of rain. One farmer west of Roosevelt reported over 5 inches of rain received there. MARK and ARVELLA MCCOLLOM are moving to Owasso, OK. Arvella will manage a nursing home there. Good luck to them in their new home. MARY GALVAN and JAGGER visited in the home of her parents, FRANK and MARY ANN VALDERAS, last weekend. They live in San Antonio, Texas. Also visiting in the Valderas home was Steve Galvan, their son who lives in Norman, OK. THINGS MY DADDY USED TO SAY: This is gonna hurt me more than its gonna hurt you. FIRST BAPTIST CHURCH, Roosevelt, honored all the graduates, including their Kindergarten, Junior High, High School, and College graduates on Sunday, May 27th. COTTON TALLEY went to visit SHANE & RHONDA TALLEY and her new great-granddaughter, TABITHA, ON Sunday. They live in Yukon. ERIC JACKSON, Sandy, Utah, recently donated two concrete Meditation Benches to be placed wherever appropriate, in memory of his parents, Aaron C. Jackson, and Ruth L. Jackson of the Con. 8 Community. The benches will be in place this weekend at the north entrance of the Roosevelt Senior Citizens/Community Center in Roosevelt. SAMMY JACKSON, Cyril, OK, recently donated a concrete Meditation Bench this week to be placed wherever appropriate, in memory of his parents, Vernie and Wanda Jackson, Roosevelt. The bench will be placed this weekend at the north entrance of the Roosevelt Senior Citizens/Community Center in Roosevelt. MADISON NICOLE is the name chosen by MORIAH COOPER WRIGHT, Nacogdoches, TX, for a new baby girl, born at 11:41 p.m., Wednesday, May 23, 2001. Maternal grandparents are JERRY RAY and MARY ANN COOPER, Nacogdoches, TX. JERRY RAY COOPER will celebrate his 50th birthday with a gala event on June 16th & 17th at his home in Nacogdoches, TX. Happy 50th, Jerry. JACK BROADUS recently spent a few days in Baptist Hospital having a heart procedure requiring three stints in two of his arteries. He is at home and recovering as expected. JAMES HARRIS is a patient at Baptist Hospital following open heart surgery for four bypasses; he has hopes of returning home on Sunday or Monday. BETTY BROADUS and LENA RUTLEDGE HARRIS, 1951 RHS Graduates, are anxious for their recovery so they may attend the reunion festivities in July. One of the attending nurses for Jack Broadus was TERESA STAFFORD, daughter-in-law of DURWOOD and MARGETTA STAFFORD; it truly is a small world. ALETHA JEAN SETTLES, Roosevelt, graduated from Snyder High School in Commencement exercises at 8:00 p.m., Tuesday, May 22, in the James G. Blaine Fieldhouse, Snyder. Aletha attended Roosevelt Elementary School and Snyder Junior High School. She plans on going to college and getting a good job afterwards. She is the daughter of Oliver Settles, Roosevelt, and Dearla Lynn, Mt. Park. RACHEL GIBBONS and LAUREN THURMOND are new summer employees at HOP & SACK, here in town. DAWN MARIE ALONZO, Roosevelt, graduated from Snyder High School in Commencement exercises at 8:00 p.m., Tuesday, May 22, in the James G. Blaine Fieldhouse, Snyder. Marie attended Roosevelt Elementary School and Snyder Junior High School. Her activities included: Basketball, Volleyball, Softball, and Newspaper staff. She is a member of the Roosevelt First Baptist Youth group. Following graduation, she plans to attend Cameron University. Marie is the daughter of ADRIAN and CONNIE ALONZO, Roosevelt, and the granddaughter of NANCY BARNES and OLIVIA ALONZO, both of Roosevelt. PENNY (MARTIN)MCCUISTON, ALLISON, and LINDSEY, Indiahoma, visited in the home of her parents, JIMMIE and CAROLYN MARTIN, last weekend. CAROLYN R. BRIDENSTINE, 85, Edina, Minnesota, died May 15, 2001. She was born March 14, 1916, near Haviland, Kansas, to Henry E. and Edith Marie (Allen) Davis. She attended Victory School, and graduated from Haviland High School in 1934. She graduated from Friends Bible College in 1936 and attended Ft. Hays State College where she earned a teacher's certificate. She taught school at Lost Valley School near Haviland in 1936 and at Victory School in 1937. She married Emmett Valdemar Bridenstine August 21, 1938 in Haviland, Kansas. The couple lived and worked in Wichita, Kansas, while he completed work on his degree at Friends University. Mrs. Bridenstine assisted her husband in his ministry at Timbercreek Friends Church near Atlanta, Kansas, from 1940 to 1943, Cold springs Friends Church in Cold Springs from 1943 to 1950 and Community Friends Church in Roosevelt from 1950 to 1960. She served as a pastor's wife in Topeka, Kansas, from 1960 to 1968 and in Great Bend, Kansas, from 1968 to 1976 when they retired to Perkins from 1976 to 1978. She became a pastor's wife again from 1978 to 1980 at Community Friends Church in rural Roosevelt and Friends Chapel in Coyle from 1980 to 1984. They retired again from 1984 to 1989. Mrs. Bridenstine moved to Edina, Minnesota, last July to be near her family. She was a homemaker and member of Friends Chapel Church. She was a member of the Farm Club and WCTU Missionary Society. Survivors include two sons, Stanley Bridenstine and wife Pat of Riverside, California; and Lester Bridenstine and wife Elaine of Edina, Minnesota; five grandchildren; three great-grandchildren; one sister Delpha Clarkson of Pratt, Kansas; and one brother Justin Davis of Weatherford. She is preceded in death by her parents, her husband Valdemar on April 20, 2000, and one brother. Services were May 21, 2001, at Friends Chapel Church with Pastor Merl Kinser officiating. Burial was at Oak Grove Cemetery in Coyle under direction of Strode Funeral Home. Condolences may be emailed to the family at strodef@aol.com. BILL and PENNY (MCCOLLOM) SCOTT write that they are well in Sand Springs, OK. All the kids are married so they enjoy an "empty nest." DENNYSE and husband ERIC are in OKC - He is director of Pastoral Ministries at Deaconess Hospital and Dennyse stays busy with their three grandchildren (BRYCE - age 5, WYATT- age 3 and MYKAY age-18 mo). DANA and husband DON live in Stillwater. Dana teaches music at Mulhall-Orlando, and Dan is a second year vet student. DUSTIN and wife RYANN live in Vernon, Michigan. Dustin is foreman for a steel construction company and Ryann is a Junior at MSU. Penny and Bill both work for the State. He is director of STARBASE, a math, science and tecnology program for elementary students sponsored by the National Guard. Penny is a Regional Coordinator for SoonerStart. They stay busy in church and community activities. Don't make it back to Southwest Oklahoma very often, except quick trips to Lawton to see Mom in the nursing home and funerals, Bill said. It was indeed great to hear from this family. OLENE DAVIS has finished her treatments following recent surgery. JANIS PETERSON was out shopping on Tuesday. KEVIN LILE will graduate with honors in Aviation from Southwestern State Technology Center in Altus, on Tuesday, May 22nd, at 7:00 p.m. He is a 1999 graduate of Navajo High School and is currently employed at Altus Air Force Base as a mechanic on the C-5 airplane. Kevin is the son of Phillip and Beverly (Howard) Lile, Roosevelt, and the grandson of J. R. and Joanne Howard and Bill and Nelda Lile, all of Roosevelt. THANK YOU, JOHNNIE and DOUG SEARS, for yet another donation to the Roosevelt: From A to Z project. The $32.00 you sent was put to good use, buying paper and a Printer Cartridge. Your generosity is indeed overwhelming. WE BELIEVE IT. "If you cant say something good about someone, dont say anything at all." RACHEL GIBBONS, Roosevelt, graduated from Navajo High School at the Commencement Exercises, Tuesday, May 15, 2001. Rachel is the daughter of Alan (Class of 1980) and Delinda Pound Gibbons (Class of 1985), Roosevelt. Her grandparents are Jimmy (Class of 1962) and Shelia Pound, Roosevelt, and Eddie and Rena Gibbons, Mt. Park. Rachel's plans are to attend college at Southwestern Oklahoma State University in Weatherford in the fall. AZELL WARD is recuperating satisfactorily and is able to be around town driving her car. Good to see you out, Azell. JOSEPH KREHBIEL, Roosevelt, will graduate from Snyder High School in Commencement exercises scheduled for 8:00 p.m., Tuesday, May 22, in the James G. Blaine Fieldhouse. East Central University awarded Joseph an ECU Instrumental Scholarship valued at $12,330 for the five year period and a $500 scholarship from the ECU Foundation. These awards were made during the May 8 Awards Assembly at Snyder High School. Joseph is the son of John and Julia Krehbiel, Roosevelt. His high school activities include: Band, 8 years; Gifted and Talented, 3 years. He plans to attend college at East Central University in Ada. OVERHEARD AT THE COFFEE SHOP: Patience is the ability to idle your motor when you feel like stripping your gears. SAMMY JACKSON and JULIE JACKSON, Cyril, have been hired by Elgin Public Schools for the 2001-2002 school year. Sammy will coach High School Boys Basketball, and Julie will teach second grade. Sammy graduated from Roosevelt High School in 1985. THINK ABOUT IT. Love is the only thing that can be divided without being diminished. DOUG and JOHNNIE SEARS went to Tulsa to help their little granddaughter, Alexis, cele-brate her 11th birthday, which was May 12th. While there, they also celebrated their son, JOHN SEARS birthday, although it wasnt until May 20th. They went Thursday and came back on Monday. The Cold Springs 2001 Reunion was a huge success. A delicious meal was served by the Roosevelt Senior Citizens Center Staff to about 60 people. Charles May and Eugene Hayslip were master of ceremonies for the event. They voted to hold another reunion in 2002. Its not too early to be making plans to attend the ROOSEVELT HIGH SCHOOL ALUMNI REUNION to be held on July 21, 2001. Bobby Sheets is the Alumni President for this event; plans are already under way to make it a spectacular reunion. If you have changed addresses since the 1999 Alumni reunion, or if you know of anyone who has a new address, please send it to Bobby or email Vonda (Miller) Binghom at vc@mmind.net or me at wjackson@sonetcom.com so we can be sure everyone gets an invitation to the 2001 Reunion. Austin Simmons, Sentinel, finished in the "Short Go" at the Oklahoma-Arkansas "Hanging Judge" Shoot-out this past weekend. He rode a big spinning bull, but was bucked off. The ride will be delay televised in about two weeks from Ft. Smith, Arkansas. Austin is the son of Sherry and Ricky Simmons and the grandson of Wanda and the late Donald Simmons. Thank you, WALTER RICKEY, for mowing around the trees at the Grade School. You do make a difference in the way the area looks. It is so very nice of you to help us keep that area clean, and we appreciate your help. PAT MILLER is recovering well from surgery at Jackson County Memorial Hospital, Altus, but things are going pretty slow. She is working with a physical therapist 3 times a day and was to be moved out of acute care facility to the skilled nursing facility either Tuesday or Wednesday of last week. She will probably be in the hospital at Altus for at least another week. Keyna Liles, daughter of Doug and Lisa Liles placed 4th at the 2001 Spring Fair at OKC with her Simmental steer. She had a great coach, Mr. Gregg Holt the Snyder FFA advisor. Madison Liles, daughter of Doug and Lisa Liles will graduate from Snyder Head Start this Friday. The event will be at 7pm at the Snyder High School Auditorium with a reception following at the community building. JOHNNY STARCHER, DONNA SCHILLER, and grandchildren KEEVYN and MACEY, Amarillo, visited Betty Moore over the weekend. They went to Yukon Saturday to visit Judy Tripp, Mr. and Mrs. Shane Talley, and Tabitha. AMANDA HENSON, a Snyder High School senior from Roosevelt, has been awarded a University of Central Oklahoma Scholastic Achievement scholarship at the Edmond university, when it begins fall semester August 20th. Amanda is the daughter of Doug and Glenna Henson. Snyder grade school girls track teams traveled to Cyril on April 12th to compete in the Cyril Grade School Meet. CANDICE ONEAL finished 1st in discus and 100 meter dash and 1st in the 400 meter and 800 meter relay competition. BROOKE MAHONEY finished 2nd in 300 meter run and 5th in 800 meter relay. On April 19th at another meet at Cyril the 6th grade girls competed again. CANDICE ONEAL placed 1st in 200 meter dash and 1st in the discus. Also 1st in 800 meter relay and 2nd in 400 meter relay. BROOKE MAHONEY placed 5th in the 400 meter run. On April 5th they competed in the Carnegie track meet. CANDICE ONEAL finished 1st place in the 100 meter dash and 1st in the 400 meter relay and 800 meter relay; 2nd in discus. BROOKE MAHONEY finished 5th in the 800 meter relay. Candice ONeal is the daughter of Wendell and Josie ONeal, Roosevelt. Brooke Mahoney is the daughter of Jeff and Shelli Mahoney, Roosevelt. These girls are members of the 6th Grade Class and coached by Royce Geiger, Snyder Schools. FRANKIE VALDERAS, son of Frank and Mary Ann Valderas, is a member of the Snyder Cyclones District Baseball Tournament Champion Team. Good luck Frankie and the rest of the baseball team. The Snyder Grade School boys track teams, 5th & 6th Grades, competed in the Carnegie Elementary Track Meet April 5th. JAMEY VANDERPOL, finished 4th in the 1600 meter relay. JAMEY VANDERPOL placed 3rd in the 600 meter relay and 4th in the 400 meter relay. JAMEY VANDERPOL placed 5th in the 1600 meter relay. Jamey is the son of Jeff and Darla Vanderpol, Roosevelt. Jowanna Trammell is the coach of the 6th Grade Team. Kashen Urban, Roosevelt, was the winner of the Reserve Grand Champion Lamb at the 2001 Spring Fair and Junior Livestock Show at the State Fairgrounds. He is a Navajo School Student, a member of the Navajo 4-H Club, and is the son of Ritson and Melody Urban. Governor Frank Keating added to the success of the sale by stepping into the auction ring to take bids during the Sale of Champions. The Lazy E Ranch, represented by E. K. Gaylord II, purchased Urban's lamb for $10,000 at the 4-H and FFA Junior Livestock Premium Auction. Urban has won grand champion or reserve grand champion honors in every major competition he has entered the past 12 months. He won Grand Champion lamb at the Tulsa State Fair, Grand Champion lamb at the American Royal in Kansas City, Grand Champion lamb at the North American International Livestock Exposition in Louisville, Reserve Grand Champion lamb in the Arizona National in Phoenix, and Reserve Grand Champion lamb in the National Western Stock Show in Denver. The Oklahoma City title is his latest. An apology is due you for the tardiness of this note; however, time can deepen an emotion or feeling to an even greater depth. And, thus emerges the gratitude with which this is spoken. Gail and I would like to express our most sincere appreciation for all the thoughts, prayers, help and support, both physically and mentally, that each of you have given so freely to us during our time of sorrow. It has not yet been a year since we lost our mom and only 4 months since Richard died, and the outpouring of love has been incredible. Richard must be proud to know how lucky he was to have had some of the most wonderful friends who also extended that same friendship to us. He is, and will continue to be, greatly missed. ALTUS Funeral for Leland M. Curtis, 79, Altus, were held at 2 p.m. Tuesday at First Baptist Church, Roosevelt. Mr. Curtis died Saturday at home. Burial was at Roosevelt Cemetery under the direction of Hackney-Gish Funeral Home, Hobart. He was a former Roosevelt resident. Survivors include his wife Mildred (Hagemeier) Curtis (Roosevelt HS Class of 1939), two grandsons, a great-grandson, and a brother, Homer Curtis, Stillwater. Everyone is invited to a wedding shower honoring DAWN and TAMMY WOOD ON Sunday, May 6th from 2:00 to 4:00 at the Fellowship Hall, First Baptist Church. Household items have been selected at Wal-Mart. Southwest colors, country blue, mauves to wines, hunter green. Tammy and Tommy are to be married on May 4th. Tommy is the son of Jim and Sharon Wood, Roosevelt. Thank you, DALE AND HAZEL BYNUM, for your additional $30.00 donation to the Roosevelt: From A to Z project. Your generosity is certainly appreciated. Thanks for your words of encouragement, also. COLD SPRINGS SCHOOL REUNION is scheduled for Saturday, May 19th in the Roosevelt Cafeteria (Senior Citizens /Community Building). Former students, teachers, and friends of COLD SPRINGS SCHOOL & COMMUNITY are planning a reunion for anyone who is interested in attending. Please bring any items of interest pertaining to Cold Springs history. If you want lunch, you need to make a reservation with Gene Hayslip, 639-2730, Charles May 639-2324, or Wanda Jackson, 639-2682. Reservations for lunch to be served by the Roosevelt Senior Citizens Center will cost $7.50 per plate. Laverne May Johnson writes that Ed Reece Kirkland has been given a new kidney very successfully. He lives at Lumberton, N, C. Galen Kirkland varies between the islands in the winter and Colorado in the summer since he retired. Carol lives in California some where. Leola Kirkland lives in Arkansas. Charles is the only member of her family still in the area. Wanda Simmons is helping Billy Sims, Saddle Mountain, to care for his mother, Fern Sims, for a few days. FOR SALE: Dog house for large dog. Call BETTY R. MOORE, 639-2443. JERRY & JOELL BRITTAIN, had a fire at their home on Sunday night. There was considerable damage, and Jerry was taken to Jackson County Hospital and later released. TOWN-WIDE GARAGE SALE to be held on SATURDAY, MAY 5. Garage sale permits are available at the City Hall for $5.00 for those participating. Katrina Chain has amazed all of us and the doctors, too, as we were able to bring her home! She has been a real trooper through all of this with much more to come. We will be having home health nurses and therapists here at home to help her instead of having to stay in the hospital. She is wearing a body brace a minimum of 22 hours per day and will wear it 8-12 months, which is the healing and recuperation time for her spinal fusion surgery. It does take two of us to move her, which we have to do every two hours. She does pretty good as long as we keep her pain medication on schedule. Four surgeons worked on her. They took out 9 discs to be able to straighten her spine and used a rib for bone grafting with the spinal fusion and of course steel rods on either side of her spine. She required a lot of blood, but once she received enough to accommodate the blood loss, her condition stabilized and she started improving at a rapid pace. Her doctor could hardly believe she was doing so great. The surgery only took 9 1/2 hours instead of 12 as we had expected! THINK ABOUT IT. We could learn a lot from crayons: some are sharp, some are pretty, some are dull, some have weird names, and all are different colors ... but they all have to learn to live in the same box. GNHA DIST #151 has scheduled a District Playday at Roosevelt on May 5 beginning at 11:00 a.m. Also scheduled is an Open Benefit Playday at Roosevelt for May 12th beginning at 11:00 a.m. May 19th there will be a District Playday at Hobart beginning at 11:00 a.m.
WE BELIEVE IT. Happiness comes through doors you didn't even know you left open. PAT MILLER had knee surgery last week at Jackson County Memorial Hospital, Altus. JENNIFER LILES, daughter of PHILLIP LILES, Class of 1973, has earned a place in the National Honor Society. She is a Junior at Norman HS, Norman, OK. The Ladies 3 Sunday School Class, First Baptist Church, Roosevelt, hosted the April Birthdays Party at Good Samaritan Center, Hobart. It was held on Wednesday, April 25th. They furnished refreshments of angel food cake and sherbet. JUST WONDERING. If Wal-Mart is lowering prices every day, how come nothing in the store is free yet? Debbie has one brother, Donnie. She plans to go to college at Weatherford, later Stillwater to major in Home Ec or Business not decided. Margie Alonzo, daughter of Mr. and Mrs. Julian Alonzo has been selected as the other "Student of the Week." She was born February 20th and enjoys volleyball, singing, and collecting shells. Margie grew up in Roosevelt, has 4 brothers and 6 sisters. She plans to go to college. April 17 Terry and Lynn Davis 17 years. ROOSEVELT SENIOR CITZENS CENTER was the recipient of a CENA Grant in the amount of $9,529.41 from SWODA recently. Pictured L to R: Jack Bonny, State Representative, J. R. Howard, Center Director, Betty Moore, Secretary, Lois Coffelt, Member, and Gilmer Capps, State Senator. I will be attending the Roosevelt reunion in July. Former students and teachers of COLD SPRINGS SCHOOL are planning a reunion for anyone who is interested in attending. Anyone is welcome to attend, but if you want lunch, you need to make a reservation with Gene Hayslip, 639-2730, Charles May 639-2324, or Wanda Jackson, 639-2682. Reservations for lunch to be served by the Roosevelt Senior Citizens Center will cost $7.50 per plate. OVERHEARD AT THE COFFEE SHOP: "Never argue with an idiot. They drag you down to their level, then beat you with experience." WANDA SIMMONS and her sister, LORETTA LINDSEY, have returned from a nice visit with their cousin, LELAND & BONNIE WHITE, of Colorado Springs, Colorado. They left Oklahoma City on Sunday, April 2 and returned home Friday. They stayed some at Lelands Mountain Home at Copper Mountain. Other scenic points they visited were Cripple Creek, Vail, Aspen, Breckenridge, Beaver Creek, and Snow Mass. Wanda, thanks for sending me the news. Also put on the calendar Brooke Bellendir's birthday is April 18th, Madison Liles is May 7th. Also I was wondering if Phillip and Curtis were on your list. If not I would like to add them. They both would like to read this. Katrina Chain was moved from ICU today, to a room. She has continued to make very good progress since her surgery on April 12th in Oklahoma City. SHARON ELLIS came home on Thursday from St. Anthony Hospital in Oklahoma City. She had hernia surgery there last Monday. BETTY MOORE visisted in Amarillo with her sister, MRS. GERALDINE WOODWARD, and also her son, JOHNNIE STARCHER. BETTY MOORE and MR. & MRS. MERT BUCHANAN went to Yukon Sunday to visit SHANE & RHONDA TALLEY and get acquainted with Bettys new great-granddaughter, TABITHA. WANDA JACKSON, along with her sister, COLETTA WILLIS, Snyder, spent Easter Sunday with her son, SAMMY & JULIE, TANNER, & KADEN JACKSON, Cyril. They took a picnic lunch to the creek on the ERNIE & GAYLA MICKLEY farm south of Carnegie. Also attending were DENA SKINNER, who is Julies mother, and the Mickley children. Dena is a sister to Gayla Mickley. Azell Ward has returned to her home after a hip replace-ment surgery in Jackson County Memorial Hospital. RUTH HOPKINS is at home now after having vein replacement surgery in a Lawton hospital. Carolyn Martin flew to Chicago, Illinois, last week on business with her job at Chicago Rawhide. She left on Monday and returned on Wednesday. The Basic Computer & Recordkeeping Class conducted by the Great Plains Vo-Tech, Lawton, held their last session on April 9th. Classes will reconvene in the fall. Instructors were Whit Bartholomew and Kent Murray. WE BELIEVE IT. Good judgment comes from bad experience, and a lot of that comes from bad judgment. STEVE SIMS visited his mother, VIRGINIA SIMS, Hobart, over the Easter weekend. He came on Saturday and brought a friend, ROXANNE. JANET and RANDY JACKSON, BRIAN, and COLVIN hosted a hamburger cookout for all. VIRGINIA SIMS donated $20.00 to the Roosevelt: From A to Z project recently. Thank you, Virginia. It is appreciated. DR. LEONARD J. KIMRAY died 27 July 2000 of cancer. He was diagnosed on 5 Mar 2000 and underwent major surgery only to find it was throughout entire body he died a slow 4 ½ months later.He always enjoyed attending these reunions and was looking forward to this one. His spirit was always up and also enjoyed the getting together for the individual class meetings at peoples homes. He will be there in spirit along with his sisters, Helen May, Bonnie Smith, and Nelda Gfell. Cathy Ragsdale, daughter of Mr. and Mrs. J. C. Ragsdale was born October 22, 1959. She is a Libra who enjoys reading, knitting, crocheting, being outdoors, and chasing boys. Cathys plans for the future are to go to college and go into physical therapy. She grew up in Roosevelt and has one brother and one sister. Ricky Simmons, son of Mr. and Mrs. Donald Simmons, was born June 23, 1959. He is a Cancer who enjoys rodeos. Ricky grew up in Roosevelt and has two brothers. He plans to go into diesel mechanics. Everybody had class last hour? The guys had crew cuts? Regina and Barbara had to sit in the lunch room? Students didnt bug Mrs. Garvin? Emma got a whipping in first grade? Johnny didnt have an afro? Mrs. Sears had trouble with Wayne? Eusebio got in trouble for hitting a girl? There were twenty people in Senior Class? JUST WONDERING. Why is possible to lead a cow upstairs...but not downstairs? Those who have been contacted so far are: James Pryor, Joshua Pryor Saville, Pauline Phillips Adams, Vernon Phillips, Beulah Phillips Davis, Wilma Phillips Blevins, Phyllis Cook Stockton, Charles May, Donnie May, Charles Rickerd, Emily Jean Martin Bennight, Pat Moore, Wanda Moore Adkins, Dobber Cook, Phillip Combs, Genevieve Brannon Henson, Juanita Brewer Lambert, Tommy McCallick, Billie Nance Stockton, Joan Nance Allard, Billy Forbes, and Barbara Baker Hilliard. One former teacher, Mr. Shoemaker will attend. Other families who may attend are the Ryders, Newmans, Smiths, and Bakers. Spouses may attend. Anyone is welcome to attend, but if you want lunch, you need to make a reservation with Gene Hayslip, 639-2730, Charles May 639-2324, or Wanda Jackson, 639-2682. Thanks again for all your work on the e-newspaper. I love getting it. Michelle Peterson, wife of Donnie Peterson, went to Abilene, TX, last weekend for the NAS Horse Barrel Races. She rode Doc, even though he had an abscess on his foot on Tuesday. He ran Friday at 16.689 seconds and then again on Saturday with 16.025 second run. Michelle said he really tried hard. They had a great weekend; enjoyed themselves and met a lot of nice people; just like they always seem to. OVERHEARD AT THE COFFEE SHOP: "Is it time for my medication, or yours?" KATRINA CHAIN, daughter of DAVID and GALEEN CHAIN, Hobart, is finally going to have her spine/rod surgery Thursday, April 12, at Children's Hospital in Oklahoma City. The surgery will take approxi-mately 12 hours and the doctor estimates she will be in ICU 7-10 days if all goes well and in the hospital 4-6 weeks. David is a RHS graduate with the Class of 1975. He is the son of Garland Chain, Cooperton. John was a member of Roosevelt High School Class of 1934. We elected new class officers. They are: Joell Vanderpol, President; James Rudkins, Vice President; Susan Smith, Secretary; Roger Slife, Librarian; Darrell Block, Teachers Helper. In Math, we started dividing by a two-place number. Most of us didnt have too much trouble. We have finished our "Tag" book Hurrah!!! We are now ready for our Primer, but will probably read several pre-primers before using the next basic reader. We are practicing for our Christmas program and are "Toys from Toyland" who have come to life. We have sent our Santa Claus letters to the Hobart Democrat Chief and will be anxiously waiting to see them appear in the paper. EDGAR WHITLOW, born November 17, 1925 in Duncan Oklahoma to Jidy and Georgia Turner Whitlow, passed away peacefully January 12, 2000 in Dallas, TX. He was the youngest of ten children. Ed was a graduate of the University of Oklahoma. He was the President of the Dallas Jaycees in 1957, past member of the Big Brothers of Dallas, the Foreign Visitors, and the Ex Roosters. He served in the U. S. Army during World War II and was owner of J & W Sand and Gravel Company. Ed was a dedicated and faithful member of the Highland Park Presbyterian Church, where he ushered the 3rd Sunday of each month. He is survived by his loving wife, Mary Jo; son, Warren Whitlow; daughter-in-law, Lori; grandson, Nicholas; daughter, Mary Louise; son-in-law, Julio Zurita; sisters, Ann Ross of El Cajon, CA, Vesta Bauman of Norman OK and Ina Cargal of Dallas and many nieces and nephews. A memorial service will be at 11:00 a.m. Saturday, January 15, 2000. Ed Whitlow was a member of the Roosevelt High School Class of 1944. DURWOOD STAFFORD was released from Mercy Hospital on February 27th to return home after more than a month. His strength and courage helped him to work hard so that he was able to return home. The family wishes to thank everyone for their support. Its not too early to be making plans to attend the ROOSEVELT HIGH SCHOOL ALUMNI REUNION to be held on July 21, 2001. Bobby Sheets is the Alumni President for this event; plans are already under way to make it a spectacular reunion. If you have changed addresses since the 1999 Alumni reunion, or if you know of anyone who has a new address, please send it to Bobby or email Vonda (Miller) Binghom at vc@mmind.net or email me at wjackson@sonetcom.com so we can be sure everyone gets an invitation to the 2001 Reunion. JUST WONDERING??? What year was it the Harry Bensel and Joe Rutledge had Donald Simmons old red pickup at the Gin Yard? They had a rope tied to an old car hood full of kids one day after school, spinning around and having fun, when the car hood started going faster than the pickupoff the kids came, one by one, and by the time the hood was in front of the pickup, it was empty! Alta Sheets called Donald at the gin and told on them. But you know the end of the story they were just kids having fun. You live in my house; you go by my rules. SAMMYE JO COOPER had a nice visit with her son, ROBERT STUCKS, and his wife, SHAWNA, from Dallas, TX. Filing period for Kiowa County municipal elections closed at 5 oclock on February 7th. JEFF VANDERPOL, incumbent on the Roosevelt City Council, drew SAM MCNEILL for an opponent. Municipal elections will be conducted on April 3rd. I remember one time in the early 50s that the ground was so hard, we couldnt stick a plow in it. Then it came a 11 rain, and there was a pond from my house at Cold Springs all the way to Hiway 183. 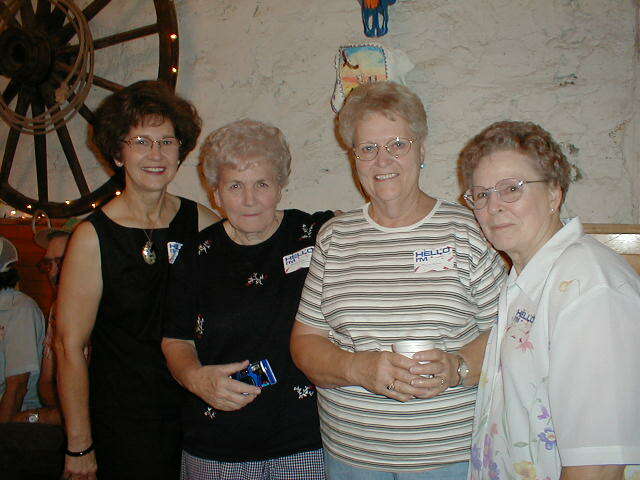 Hostesses held a Baby Shower for KAREN and BRENT JOHNSON on Saturday, March 3, 2001, in the home of Sharon Raasch. Karen is the daughter of Elizabeth Block and the late James Dale Block. Brent is the son of Sonny and Peggy Johnson, formerly of Cooperton. Karen and Brent are both graduates of Roosevelt High School. They live at Rt 2, El Reno, OK.
AMANDA HENSON was in the Snyder Band Group attending the District Solo and Ensemble Contest at Lawton on Saturday, February 24th. She plays the clarinet, and was accompanied by a piano. She received a Superior rating in the High School category, qualifying her to attend the State contest on April 17 & 18. SHANDA JACKSON, a Snyder teacher, and wife of DUSTIN JACKSON, Roosevelt, was one of the piano accompanists. Amanda is the daughter of DOUG and GLENNA HENSON, Roosevelt. GAYELEEN STROUD fell on the ice Wednesday and suffered a broken bone. She will require bed rest for a few weeks before returning to work at the Hop & Sack. BOB and PATSY EVANS, Allen, TX, and former pastor of the First Baptist Church here, visited in town this week, looking at the new Baptist Church. They also visited with Dale and Hazel Bynum. TRINITY SIMMONS, daughter of Reid and Pam Simmons, Mangum, showed the Grand Champion Lamb at last Saturdays local sheep show. She placed 1st, won Breed Champion Dorset, and won Grand Champion. Trinity is the granddaughter of Wanda Simmons and the late Donald Simmons. BOBBY SHEETS was in Roosevelt at the Senior Citizens Center for lunch on Tuesday and Thursday this week, working on the Alumni Reunion 2001. Just when you thought you knew everything... To clean a toilet: Pour a can of Coca-Cola into the toilet bowl. Let the "real thing" sit for one hour, then flush clean. The citric acid in Coke removes stains from vitreous china. It will also clean road haze from your windshield. This is why we drink PEPSI products!! We're too busy CLEANING with the coke!! WE BELIEVE IT! Sometimes the best way to convince people they're wrong is to let them have their own way. THINK ABOUT IT. The less a thing can be proved, the angrier we get when we argue about it. RODEO NEWS: Ricky Simmons tied for 5th and 6th place at the Clinton High School Rodeo. He will participate in five more rodeos before entering the Oklahoma High School Finals June 23-26 at the Fair Grounds Arena in Oklahoma City. Mrs. Little a new home. Janice give it to hungry children. Curtis shares of stocks in Corny Glass. Pam go to professional reducers. Greg C. girls and a car. Roy fix up a pickup. Ceclia give it to the poor. The Roosevelt Senior Citizens held their organizational meeting on Tuesday, in the Center. Current officers are: J. R. Howard, Center Director; Lois Coffelt and Deloris Swanson, Activity Directors. Roosevelt Senior Citizens Board of Directors are: Dale McCollom, President; Will Cornwall, Vice President; Hazel Bynum, Secretary; Betty Moore, Treasurer, Lois Coffelt, Member. Dale Bynum requested he be removed from the Board of Directors. The Center will be open for meals on Tuesday, September 5th with chicken fried steak, creamed potatoes and gravy, corn, tossed salad, hot rolls, and chocolate pudding. Thursday, September 7th meal is chicken strips, potatoes and gravy, mixed vegetables, salad, texas toast, and ice cream. Brooke Mahoney with her 1st Place Cross Breed lamb at El Reno Lamb Jackpot Show. Daughter of Jeff (Class of 1981) & Shelli Mahoney. Granddaughter of Martin (Class of 1960) & Beth Mahoney, all of Roosevelt. Also Great-granddaughter of Alline and the late Dale Penrod and Vernie and the late Bill Mahoney, Roosevelt. Photo taken July 29, 2000 at El Reno, Oklahoma; property of Shelli Mahoney. BULL RIDER AUSTIN SIMMONS PLACES AT RODEOS! Austin Simmons, son of Ricky and Sherry Simmons, Sentinel, has been busy this past weekend at the rodeos. He rides those scary bulls. He placed 3rd at Cheyenne, OK at the Youth Rodeo; 3rd at Butler in an open rodeo; and placed 2nd in the Go Round at Mountain View High School Rodeo. Keeps Ricky, Sherry, and Grandma Wanda Simmons on the road watching him ride. ADAM DAVIS, NEW ENGLAND PATRIOT, ENTERTAINS! Adam Davis called his grandfather, Nelson Davis, on Sunday, August 13th. He told his grandpa he was invited to a "pro" poker game as an entertainer; he played the guitar for his Patriot teammates and received $80 in tips. You may have something going there, Adam! Adam is the son of Reid and Cheryl Davis. He is #61 on the New England Patriots Roster. In this area, I have included links to specific pages of my e-zine. Billy Burton and Charlie Schultz met in Hobart on Wednesday, August 23, to compare notes regarding the Farm Management Program conducted by Great Plains Vo-Tech, Lawton. Billy is a Field Unit Supervisor for the Oklahoma Boll Weevil Eradication Program with offices in Hobart. Charlie will retire on Friday, August 25, from the Great Plains Vo-Tech. He has conducted Farm Management Classes at the Roosevelt Site of Great Plains Vo-Tech since 1994. Billy Burton, Paul Riley, and Charlie Schultz gather in the Computer Room at the Oklahoma Boll Weevil Eradication Office. Billy is a Field Unit Supervisor; Paul is a Computer Specialist; and Charlie is the Farm Management Instructor for Great Plains Area Vo-Tech, Lawton. A group of Roosevelt former & present residents gathered in Lawton over the Labor Day Weekend to visit and talk over "the good old days." Becky Smith, First Deputy at the Kiowa County Assessors office, is changing jobs after working at the assessors office for 14 years. Tuesday was her last day there, but she will continue working at the Hobart Wal-Mart for the next week. Then she is moving to Duncan where she will work in the new Wal-Mart Supercenter. Letitia Stockton will now be the First Deputy in the assessors office. Becky said her reasons for moving are many. Her mother, Ruby Clark, lives in a nursing home in Duncan. And her brother Lex Clark lives in Duncan and Troy Clark lives in Marlow, seven miles away. Beckys children are away at college. Her son Seth is a sophomore at Southwestern Oklahoma State University and her daughter Amanda is a freshman at the University of Oklahoma. I am starting over, Becky said. I am having a mid-life crisis and empty nest syndrome, all in one. Reprinted from The Hobart Democrat-Chief, August 31, 2000. NOTE: Becky graduated from Roosevelt High School in 1972. Good luck, Becky. Pete Cooper (left) accepts a service award recognition pin for 35 years of service from Acting Postmaster Teddy White during a ceremony Thursday morning at the Hobart Post Office. White read a letter from Billy Wilson, Acting District Manager, which read, "The performance that you have given for 35 years has allowed this organization to be the best." Cooper is Rural Route Two Carrier and lives in Roosevelt. Cooper said he has worked in five different post offices during his career. Bearcat Coach Mike Lunsford, in his second year at the helm, discusses the finer points of football with junior lineman Garrett Jennings. A starter last year as a sophomore, Jennings is one of the many linemen who have shown great improvement since last season. Garrett is the son of Nell Jennings and Terry Jennings, Roosevelt. He is the grandson of Bobby and Helen Jennings, Roosevelt, and Pat and Oma Lynn Buchanan, Roosevelt. Photo by Todd Hancock. Reprinted from The Hobart Democrat-Chief, Hobart, Oklahoma, August 24, 2000. A group of area youths attended the Youth Evangelism Conference in Oklahoma City on Friday and Saturday, August 11 and 12. Those attending were Rachel Gibbons, Marie Alonzo, Amanda Henson, A. P. Alonzo, Josh Henson, Joe Krehbiel from Roosevelt; Ashley Ford, Ashley Flowers, Alan Harthun, John Tidwell, from Snyder, and Nathan Brumley from Tipton. On Friday they had breakfast at the Spaghetti Warehouse then went to the morning session of the YEC. On Saturday they went to Frontier City where they enjoyed some rides and attended a concern featuring "Third Day," a Christian musical group. Doug and Glenna Henson, Roosevelt, and Will and Debbie Johnson, Snyder, accompanied the group. The Cooperton Reunion was all day Saturday. What fun. Huge crowd. The community should and do feel mighty proud of the addition of a new kitchen and two bathrooms. It is spacious and very nice. It was paid for partially by a grant, free labor and generous donations. Some of the funds donated for materials were in memory of Tip and Mabel White, constructed by Allen and Betty Moore and James Raasch. 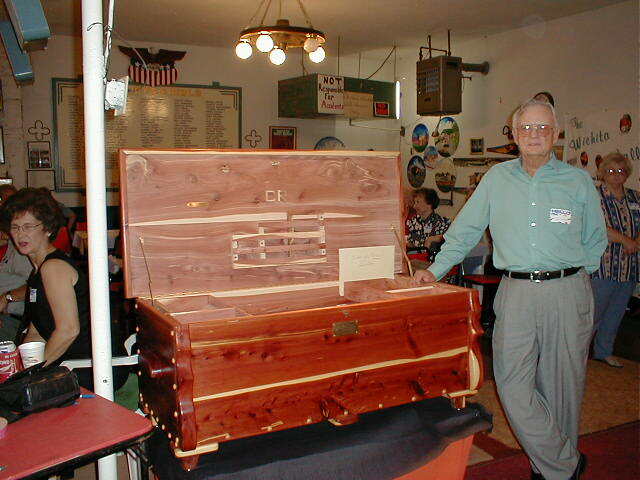 LaVoy Jennings won the beautiful cedar chest made from cedar trees from the schoolground and built and donated by Betty and Allen Moore. A total of $1,385 was donated by reunion-goers trying to win the chest. Dean Reeder, president of the reunion this year, asked his Aunt Roma to draw the name out of the hat and out came the name of cousin LaVoy. Dean is related to LaVoy, not only through his dads side of the family, but through Bells side of the family. Fixed deal, someone yelled. LaVoy was so proud of his win that he thought it would be a nice burial container and jokingly asked Allen if he and Betty could cut two holes at the end of the chest. The Moores were presented a placque showing appreciation for all their work. Other officers working to make the reunion a success were vice president, Lonnie, Riley, secretary-treasurer, Joyce VanDerPol and her assistant, Peggy Johnson. Other workers recognized were David Lester, Bradley Johnson, Bell Reeder, Oma Buchanan, Betty Moore, Kenneth and Arlene Boyd, and Weldon Johnson. Names of students from the class of 1949 were read: Charlotte Askew, Dorothy Carr, Lewis Pearce, June Demarcus, Billie Huddleston, Jack Haley, Chester Buchanan, Della June Liles, LaVerne Cox, Idella Neuwirth, Vera Marie Goodin, Zelma Miller, Leta Johnson. From the class of 1950: Rendall Mace, Norma Fritz, Billy Henderson, James Swanson, Barbara Sommers, Delma Liles, Margaret Crain, Delta June Delk, Jetta Hilbern. A poem, written by Allen Moore was read by Stephen Boyd. Jim Taylor also read a poem he had written. Following the Memorial list read by Joyce VanDerPol, Bennie Moore offered prayer. New officers elected were Bill Sims, president; Joyce VanDerPol, secretary-treasurer, Carolyn Delk, assistant to Joyce. The 33rd Dempsey reunion will be held Sunday, August 13, at the Snyder Community Building. Relatives and friends are welcome. For further information, contact Minnie Dempsey. TAMPA - American military leadership for a volatile region passes to a new general. Marine Gen. Anthony Zinni handed over control of the U. S. Central Command on Thursday to Army Gen. Tommy Franks, who became leader of American forces in much of the middle East. 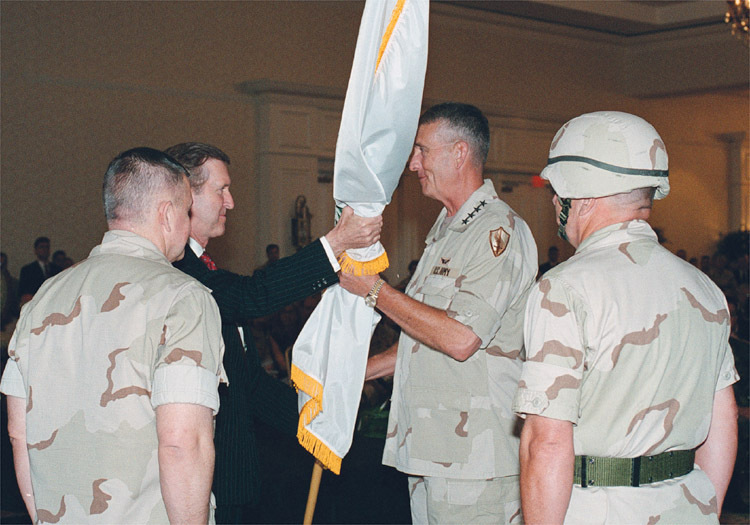 Franks was promoted to four-star general by Army Gen. Hugh Shelton, chairman of the Joint Chiefs of Staff, immediately before the change-of-command ceremony at the Tampa Marriott Waterside Hotel's Grand Ballroom. Along with Shelton, Secretary of Defense William Cohen attended the ceremony to praise Zinni's performance. This page updated March 18, 2001, in Roosevelt, Oklahoma, and surrounding communities ....KEEPING IT COUNTRY! Erma Welch, who has been hoospitalized for some three months, returned to her Cooperton farm home this past Sunday. She was diagnosed with Guillian Bare and was admitted to Mercy Hospital in Oklahoma City. She later moved to a nursing home center. This is the same ailment that struck Linda Guthrie a few years ago. Receovery is slow, but neighbor and friend Joyce VanDerPol said Erma is doing well and glad to be home. Dalton Welch has been spending nights with her and Lindsey Mercer is visiting her this week. Here I might add a GuestBook Web Gem so I can keep track of visitors to this site.